Are you looking to expand your Reiki practice to include animals? 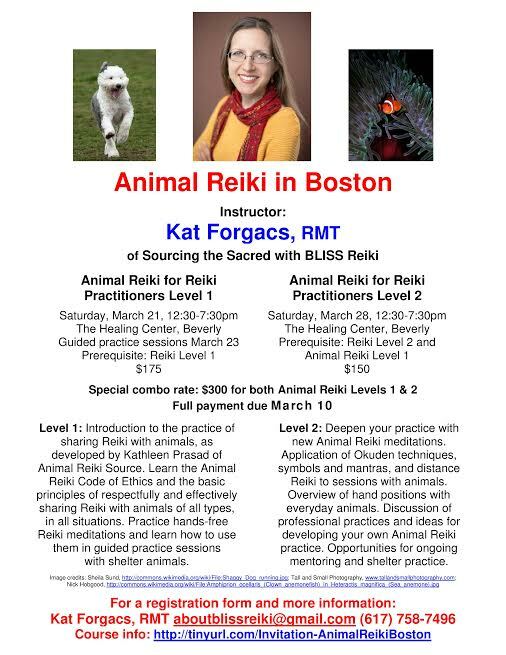 Kat Forgacs, Reiki Master Teacher of Sourcing the Sacred with BLISS Reiki and Certified as a Teacher of Reiki and Animal Reiki by Kathleen Prasad of Animal Reiki Source is bringing Animal Reiki Training to The Healing Center! in March. TRACK ONE is for Reiki practitioners. All classes will be held from 12:20-7:30 pm. There are a few spots left, so contact Kat today! Next postHave you been wanting to give Reiki to animals but aren’t yet Reiki certified?